‘Tis the Season to wine and dine on warming delights and endless canapes in magical wonderlands. Seasonal menus filled with festive favourites replace the standard offering in eateries, from frosted cocktails and candied chestnuts to spiced pumpkin lattes. 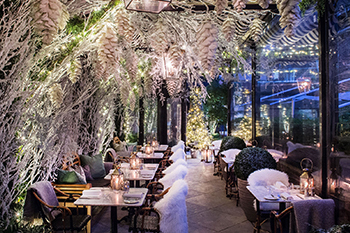 London’s Dolloway Terrace is among the restaurants in the capital to embrace the festivities, transforming into an icy haven of crystallised white, pink and silver petals. The sort-after spot this season is inviting guests to cosy up on their covered rooftop terrace any time of day. From bright brunches featuring Truffle Croque Madame and a hearty Green Shakshuka with a dusting of gold from our fabulous eggs, to tempting afternoon treats and warming suppers such as pigeon pie. Whether you’re popping by to Dolloway or a winter wonderland near you, we hope you have a very merry time!